It is a good day for trade as a warm September sun adds to the genial quality of this Plains gathering. From the early 19th century to the 1870s, trade for furs and hides was a lucrative business. Traders and bands of Plains Tribes would gather at prearranged locations and exchange tools, cloth, blankets, finery and guns for the Indians’ pelts and hides. This group of Indians is well known to the traders, as the chief trader has been married to the sister of this band’s chief for several years. Other members of the trading party have Indian wives as well, so a familial atmosphere of mutual trust and friendship prevails. Z.S. 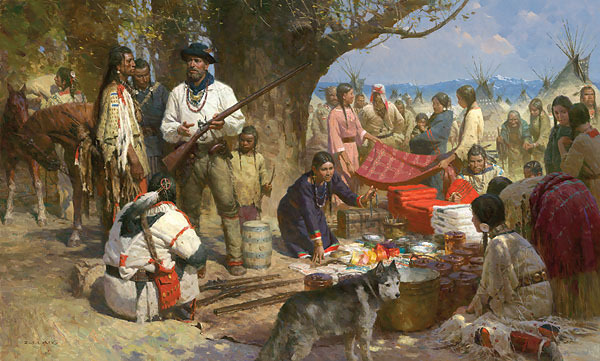 Liang’s Trading with the Blackfeet, Montana Territory, 1860 is regarded as one of his finest works to date. At the 2009 Master’s of the American West Fine Art Exhibition and Sale, where it set a record sale price for a Liang original, the work received the David P. Usher Patrons’ Choice Award, an honor bestowed on the painting by collectors attending the event.